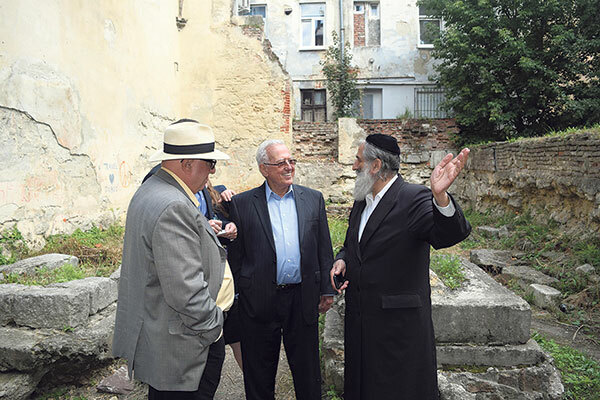 Meylakh Sheykhet, a leader of the Jewish community in Lviv, right, stands beside Larry Lerner, center, and Rutgers University professor Stephen Bronner in the ruins of the Golden Rose Synagogue, which Sheykhet hopes to rebuild. For decades, Larry Lerner of Warren has been especially concerned about anti-Semitism and other human rights violations in Ukraine, the land where his parents were born. Now as president of the Union of Councils for Jews in the Former Soviet Union (UCSJ), he is concerned that Ukrainian municipal governments, especially in the city of Lviv, are not willing to protect Jewish historical sites, many of which date back as much as seven centuries. On April 5 and 6, he and six other members of UCSJ met with State Department officials in a session led by Ira Forman, its special envoy to monitor and combat anti-Semitism. Lerner said he and his group continue to seek U.S. government support in a series of legal challenges to enforce rulings in favor of preservation. For the past three years, UCSJ has been losing a battle with a private real estate developer who has already torn down parts of Lviv’s Golden Rose Synagogue, which was built in 1582. The hotel planned for the site would endanger the mikva and other Jewish artifacts at the synagogue. Another focus of UCSJ’s preservation efforts are Lviv’s two Jewish cemeteries; one dates back to the 1400s, a newer one opened in 1914, and both are in danger of being plowed over. A hotel and spa complex has already been built on the site of the Nazi-run Janowska concentration camp in Lviv, where nearly 7,000 Jews were killed by Ukrainian nationalists and German troops during World War II. 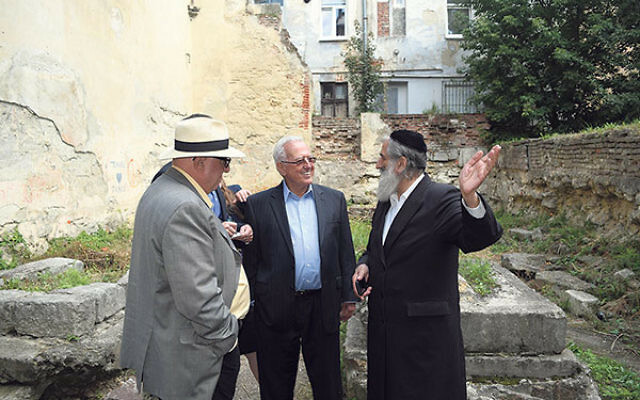 In order to fight the preservation battle, UCSJ maintains an office in Lviv run by Meylakh Sheykhet, “a religious Jew who is deeply concerned about the destruction of Jewish cultural sites,” Lerner said. But the emissary seems to be losing his argument with city authorities. “Sheykhet goes to the City Hall in Lviv and complains, ‘You can’t do that. These are historical sites and the Ukrainian government has signed agreements to protect them.’ They ignore him,” Lerner said. They plan to visit the Ukrainian cities of Dnipropetrovsk, Odessa, and Kiev and to meet with rabbis “who have the eyes and ears to know what’s going on,” said Lerner, and with Jewish leaders such as Josef Zissels, vice president of the World Jewish Congress and chair of the Euro-Asian Jewish Congress. It will be Lerner’s 10th visit to the area since he first went there in 1979. “I found the Ukrainians to be the bravest people in the world because they were fighting for freedom in the difficult heart of the evil empire,” he said. “I can’t change the world but I can have some effect in the area.